My card is the one I made for Emma's 8th Birthday last week, she is doing well and almost back to her usual boisterous and chatty self. Beautiful. Wonderful choice of papers and embelishments. I'm glad Emma is doing well now and I know this gorgeous card will have cheered her up no end. Such a beautiful card Pat. I love the sweet image and gorgeous detailing. I am SO pleased that Emma is feeling much better, it must be such a relief for you all. Beautiful card Pat and perfect for any girl. So gorgeous Pat, love the sweet image. This is a beautifully bright and happy card Pat and with a lovely feminine touch. Thanks so much for joining in our Birthday celebrations at Allsorts challenge. Ahh she is sweet - glad Emma's getting back to herself. Beautiful card Pat I love that image and the colours you have used for her, I must admit I have just bought a couple more of these images, lol, the card design is superb. 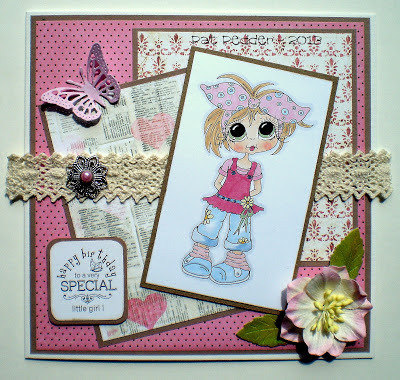 Thank you so much for joining in this weeks LEJ Designs Challenge #55 - Celebrate, over on the LEJ Designs Challenge Blog. Beautiful card. Love the thick cream lace border with that gorgeous image and the beautiful backing papers. This card is layed out perfectly and finished off to the last detail. I hope we will see you entering more of our weekly challenges in the future as there are always great prizes to be won. Gorgeous creation, thanks for joining Joanna Sheen challenge, good luck. Let's hear it for the girls !!! So glad that Emma is doing well and her birthday card is delightful!